It seems like every day there’s a new study suggesting the thing you love is the thing that will be the detriment to your health. Social media has seriously negative effects on your well-being. Taking selfies is now officially a mental disorder. And if you’re thinking of streaming a marathon of your favorite 90s sitcom, be forewarned that you’re increasing your risk of diabetes with every will they/won’t they moment Ross and Rachel share. 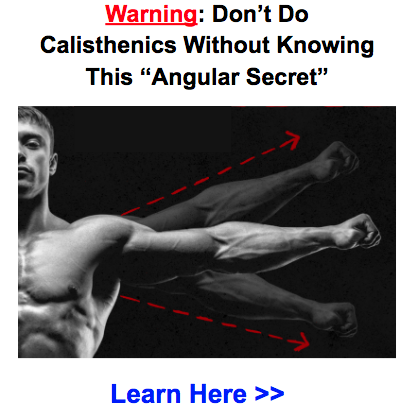 Well, it seems there’s something else that can adversely affect your health–something you’re probably doing right now. You may want to sit down stand up for this. Sitting down for the majority of the day (at work, school, etc.) is very unhealthy. Sure, it was never exactly looked at as a great way to get in shape, but it’s at least been accepted as a necessary evil so that we can learn or get work done. But just how bad is sitting all day for our bodies? In fact, our lives can be shortened by as many as 22 minutes for every hour spent sitting, according to a study from the Center for Personalized Health Care at Ohio State University’s Wexner Medical Center. Scientists have even given it the name sitting disease, and you’re not immune to it even if you exercise regularly. “I run an hour a day, but I was shocked to see how few steps I took in the other 23 hours,” says Dr. Erin Michos, a preventative cardiologist and marathon runner. Dr. Michos wore a step-tracking device to see how sedentary most of her day was and now is more mindful of moving during the day. 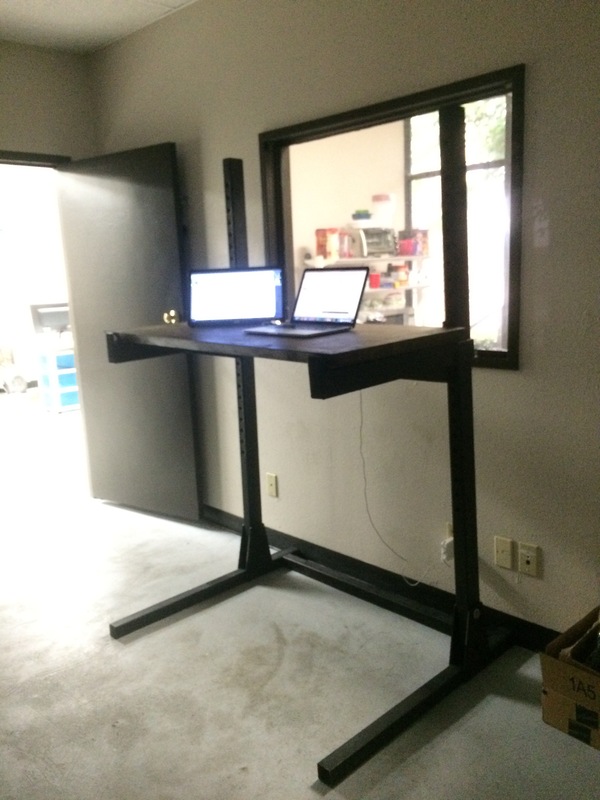 The need for change has resulted in the emergence of alternative desks, or sit-stand desks. If you have not seen them in your school or place of work, they are adjustable desks that give you the option to work in a standing position. According to a Stanford University study on back pain, workers were 78% more likely to report a pain-free day than those who used regular workstations. A 2015 study published in the Oxford Journal of Public Health shows that sit-to-stand desks in classrooms appear to be an effective way of reducing sedentary behavior (prolonged sitting) in a diverse sample of children. A 2011 study published by the Centers for Disease Control and Prevention shows that when workers are equipped with sit-stand workstations, prolonged sitting is reduced and mood states improve. The University of Iowa conducted a study of employees with sit-stand desks and found they burned more calories than those that sit, and stood about an hour a day more in comparison. 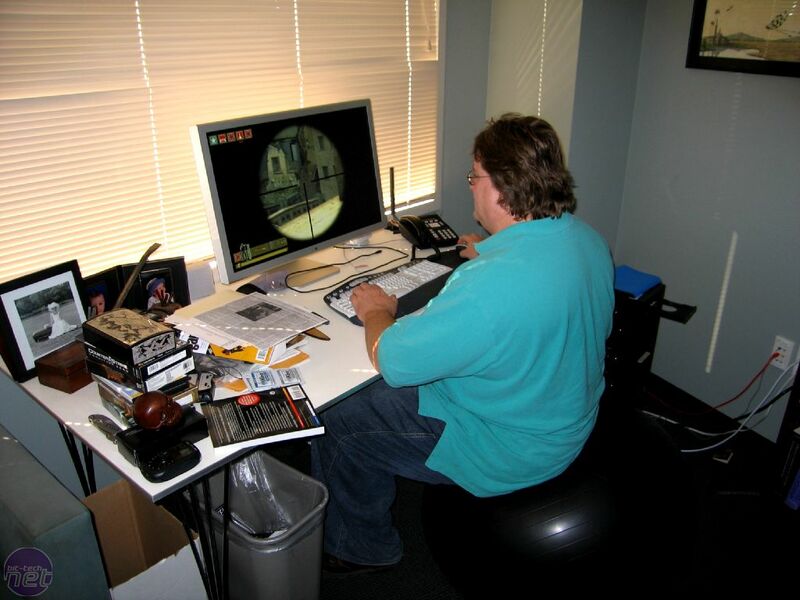 And if you’re looking for a completely subjective opinion on the benefits of a standing work station, this guy has been using one for five years. He says it’s helped eliminate his chronic back pain, improved his posture and improved his productivity, among other things. History is full of accomplished individuals who used standing desks, including a founding father, a world-renowned musician, and the author of the greatest burn of all time. We’re inclined to believe there is something to be said about breaking up a sedentary lifestyle. Anything that is going to improve your health using only your body is something we’re all for. It is important to remember, however, that this should be a compliment to your healthy lifestyle, not the be-all and end-all solution. 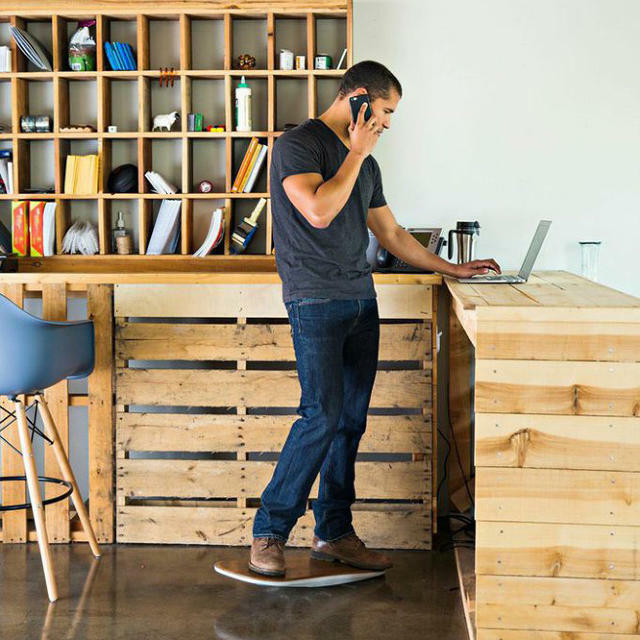 So here are some alternatives to the sitting desk. Using rollers and counter-weights, this guy’s do-it-yourself desk can hold over 250 pounds of weight and transitions from sitting to standing desks with ease. With multiple monitors, you can more easily use programs simultaneously, set up fairly easily and quickly reference important information. 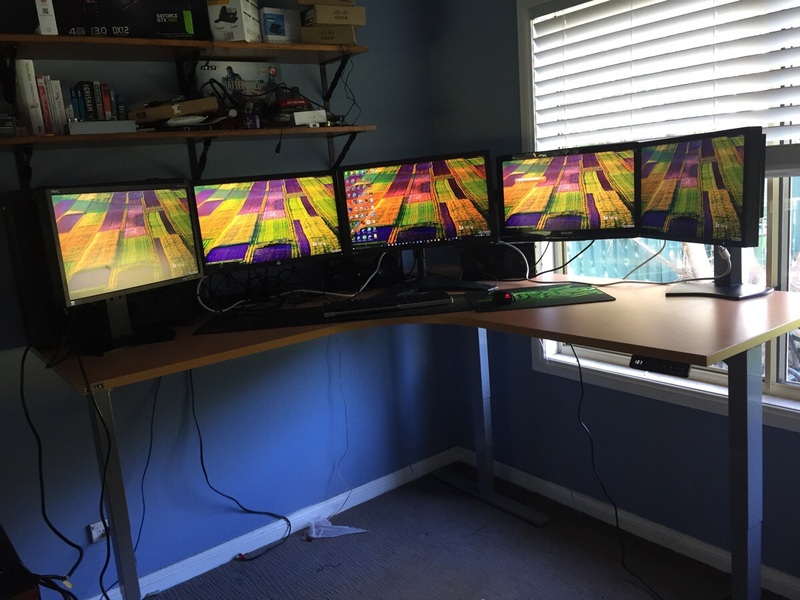 Not many people choose to go for five screens, but that sure opens up your possibilities. Check out what this guy did with a suspended bridge concept. Using pulleys and a whole lot of wood (sorry, Magneto, no bringing down this bridge), this guy created something very special. Here at SOA, we’ve got a lot of options for you that are great alternatives to heavy weights and equipment. But once you make the transition, what do you do with the old, clunky equipment? 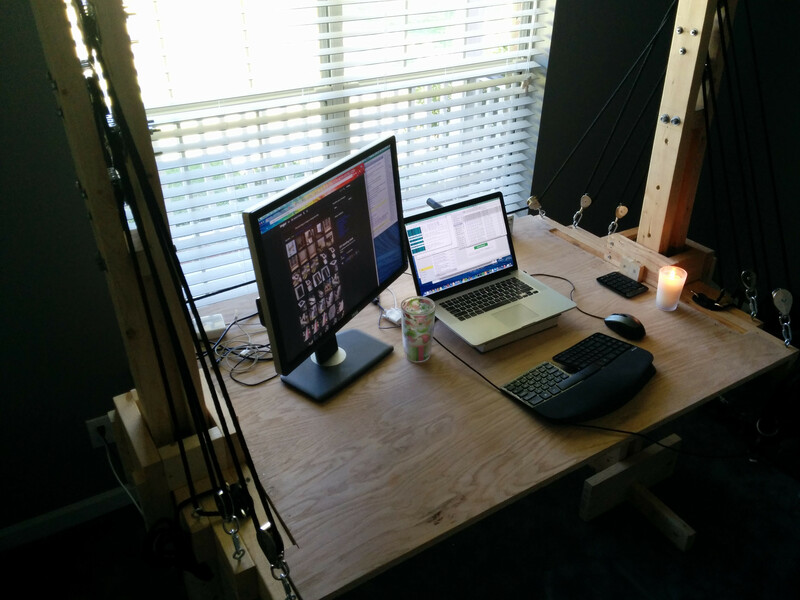 Well, if you’re like this imgur user, you turn your former squat rack into a standing desk. When you’re taking a break from standing, try opting for an exercise ball. An exercise ball can counteract the poor posture of a chair while building core strength. Try switching out the chair for the ball 20-30 minutes a day to start. For those of you who want to kick your get-healthy-while-working efforts into high gear, consider a treadmill desk. When Craig Engler finally decided he needed to get healthier, he was confronted with the bothersome fact that he hated going to the gym. It was boring and inconvenient, so instead, he fashioned himself a treadmill desk. As a result, Gengler lost 67 pounds. The desk was more expensive than he anticipated, but he says its high cost and quality would be incentive to use it often. And for you employers out there looking to energize your workforce, there’s research that suggests treadmill desks are good for business, enhancing productivity. Note: If, like many others, the reason you’re opting for a standing desk is lower back pain, we’ve got a great article with some exercises that should help. for older people who club together to play Scrabble. 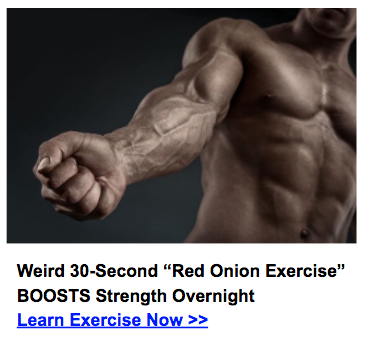 of this element to meet his needs, unless he adds a supplement. Thеse demand frеedom to join a union, bargain collectively and take action (Ϲonventions No. ), and no discrimination аt operate (No.